And he took bread, gave thanks and broke it, and gave it to them, saying, “This is my body given for you; do this in remembrance of me” (Luke 22:19 NIV). Remembrance is the Greek word, anamnesis. Anamnesis does not mean memory by mental recall, but the fresh experience of a past event by reenactment. 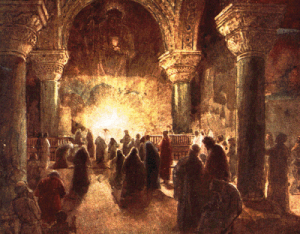 This mysterious work of the Holy Spirit brings the evening of the Last Supper forward in order that the people of God may experience the crucified and resurrected Christ afresh. 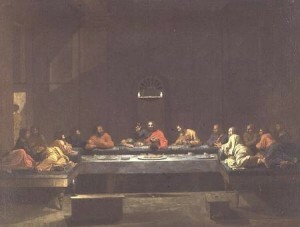 At the Last Supper, the apostles realized all the benefits of the Cross before Christ actually died. In the same way, when we partake of the Body and Blood of Christ, we encounter afresh all benefits of Christ work on the cross: freedom, forgiveness, life-transformation, etc. These benefits are imparted to us at the moment we partake of the Body and Blood of Christ (Luke 22:19; 1 Cor. 11:23-26). I believe music-centered worship has indeed become a common way of thinking about the presence of God. However, it is an extremely limited understanding of God’s presence. . . . The church has always believed not only that God is everywhere but also that he is made intensely present to his church at worship. God is there in the gathering of the assembly, in song, in Scripture reading, in prayer, and especially at bread and wine. Jesus told his disciples that there is a way to remember him (the force of anamnesis is “to make me [Christ] present”). He is right there at broken bread and poured-out wine. Robert E. Webber, Ancient-Future Worship: Proclaiming and Enacting God’s Narrative. (Grand Rapids: Baker Books, 2008), 133-134. This entry was posted in Holy Eucharist, Robert E. Webber and tagged Holy Eucharist, Robert Webber on April 7, 2010 by GlennDavis. Worship Is For God. Duh! “Worthy is the Lamb who was slain, to receive power and wealth and wisdom and might and honor and glory and blessing!” And I heard every creature in heaven and on earth and under the earth and in the sea, and all that is in them, saying, “To him who sits on the throne and to the Lamb be blessing and honor and glory and might forever and ever!” And the four living creatures said, “Amen!” and the elders fell down and worshiped. The public worship of the church is a prayer of praise and thanksgiving directed, not to people, but to God. This approach is a paradigm shift from the current presentational notion of worship. Today worship is frequently seen as a presentation made to the people. . . . But the ancient church did not design (a contemporary word) worship to reach people, to educate people, or to heal people. Yet in their worship, which was a prayer of praise and thanksgiving offered to God, people were indeed led into contemplation of God’s mighty acts of salvation and stimulated to live a life of participation in the life of God in the life of the world. The point is, of course, that how we pray shapes who we are. Robert E. Webber, Ancient-Future Worship: Proclaiming and Enacting God’s Narrative (Grand Rapids: Baker Books, 2008), 161-162. 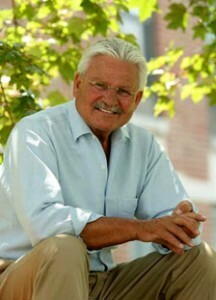 This entry was posted in Robert E. Webber, Worship and tagged Robert Webber, Worship on May 11, 2009 by GlennDavis. The one true fulfilled and meaningful life is not the life of acquisition, power, fame, sexual freedom, consumerism, or materialism but the cruciform life. The spiritual life is lived out of the crucifixion. It is a willing, voluntary choosing to give oneself to others, to endure suffering for the needs of others, even, if necessary, to the point of death. 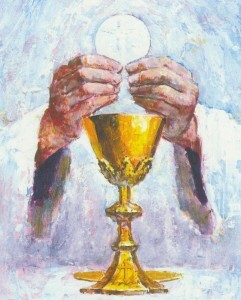 Table worship (i.e., Holy Eucharist) nourishes this commitment because it discloses the meaning of life as the act of giving up self in order to do the will of God for others. Robert E. Webber, Ancient-Future Worship: Proclaiming and Enacting God’s Narrative (Grand Rapids: Baker Books, 2008), 143-144. This entry was posted in Holy Eucharist, Robert E. Webber, Servant and tagged Holy Eucharist, Robert Webber, Servant on March 23, 2009 by GlennDavis. When we bless the cup at the Lord’s Table, aren’t we sharing in the blood of Christ? And when we break the bread, aren’t we sharing in the body of Christ? And though we are many, we all eat from one loaf of bread, showing that we are one body. While the Bible discloses the story of the world in words, the same story is enacted at bread and wine. Rationalism cannot embrace this, for it only sees bread as food that is eaten and wine as drink that is imbibed. But when we come to the Table with the eyes of faith, we experience the burning conviction that we live in a supernatural world. . . . At bread and wine we see creation, fall, incarnation, death, resurrection, ascension, church, the kingdom, and the promise of the new heavens and new earth and our own transfiguration accomplished through God’s union with us established through Jesus by the Spirit. Robert E. Webber, Ancient-Future Worship: Proclaiming and Enacting God’s Narrative (Grand Rapids: Baker Books, 2008), 141. This entry was posted in Holy Eucharist, Robert E. Webber and tagged Holy Eucharist, Robert Webber on March 16, 2009 by GlennDavis.